Sparking Joy: Are Fires Good or Bad? Franklin wrote, in sentence 48 of The Way To Wealth: Three Removes is as bad as a Fire, with the word Removes meaning what we now call moves: the process of changing residences. Franklin’s immediate meaning is that changing residences, starting over someplace else, is costly: damages and losses ensue. Fair enough. In my family, I heard that my Grandmother Rose Mangold used to say Three moves is as good as a fire. The change from bad to good seemed a wry turn of phrase, in that fires (as well as the shakedowns brought about by relocating) helped one shed unnecessary clutter. Also fair enough. I assumed this change of polarity came about in America, within the English language, until this morning. I came across a copy of Georg Buchmann’s GeflügelteWorte: Der Zitanenschatz des deutschen Volkes, which describes the sources of various German proverbs. Looking up Benjamin Franklin in the index, what did I find on page 435 but the combination of Three removes are [sic] as bad as a fire with Dreimal umziehen ist so gut wie einmal abbrennen, or Three mvoes is as good as one fire. The polarity switch from bad to good in print from the 30th printing in 1961 of the 1864 collection. Grandma Mangold spoke German in her early days in Iowa, so I now credit her wisdom to her Swiss community in addition to American cleverness. Franklin’s context is to be steady, settled and careful in order to accumulate wealth. This has happened throughout America, and the current vogue is more towards de-cluttering by asking if individual items “spark joy” for the holder. 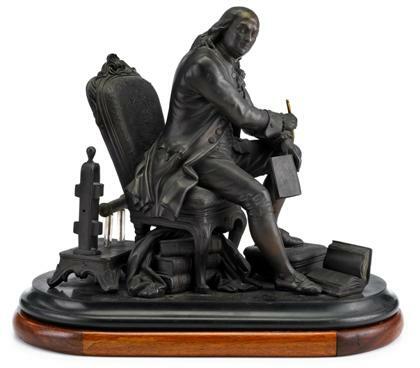 Franklin addressed accumulated clutter partially in his discussion of Order in his plan for moral perfection (in the Autobiography): specifically, the lack of an orderly method of keeping things caused him problems as his memory did not keep up with his accumulations. I can’t just now recall it Poor Richard as addressing clutter, other than to avoid gathering it in the first place: Buy what thou hast no need of, and ere long thou shalt sell thy Necessaries. I hope that does not apply to books about German proverbs. The Way to Wealth sources.